With the release of Anthem just a bit over a month away, BioWare has opened the gameplay floodgates, and now they’ve teamed up with IGN to provide a fresh look at Fort Tarsis. This bustling hub is where all the traditional BioWare character interaction and RPG elements will take place, so fans have, understandably, been pretty curious to see more of it. Fort Tarsis certainly looks visually impressive, almost as nice as the glimpses we saw in the first Anthem teaser trailers, although it seems like the framerate in the hub might be a little shaky. The city will change and develop as you play, with new areas opening up and the occasional emergency cropping up. 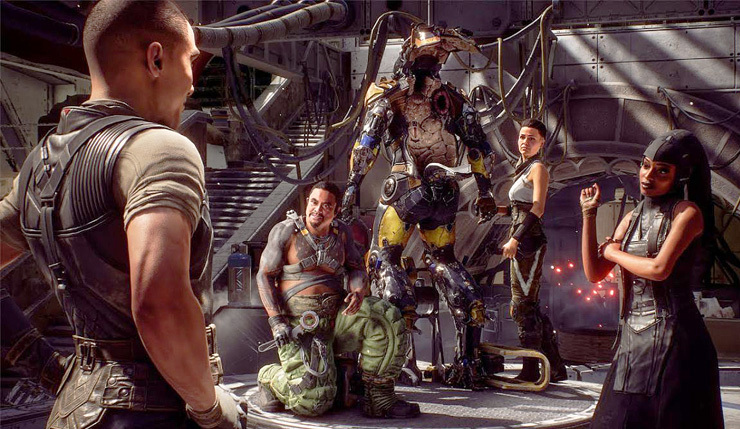 We also get a look character interaction, which seems a bit simplified compared to past BioWare games – dialogue options appear to be pretty limited. Also, while certainly a step up over Mass Effect: Andromeda, NPC faces are still a touch wonky. Check it out for yourself, below. Color me cautious about Fort Tarsis. What little we’ve seen looks pretty good, but I’m just afraid the hub will end up feeling limited. I’m looking for something you can really dig into and explore. Hopefully we get a better sense of just how big Fort Tarsis is, soon.